While some methods of treating pain tend to focus specifically on the body part, organ, or area where the pain resides, the innovative RITM SCENAR® therapy instead acts upon the body as a whole. With RITM SCENAR therapy, pain relief is significant and long-lasting because it seeks out existing imbalances in the body and treats each of them, which begins a process whereby overall health can be restored. RITM SCENAR® therapy also activates the body’s innate ability to release endorphins, which are its own natural pain killers. Ultimately, RITM SCENAR therapy serves as a catalyst to power or restart the body’s own natural healing processes. What is the RITM SCENAR Device and How Does it Work? The RITM SCENAR® is an electro stimulation device used by our Weston chiropractic center to deliver computer modulated therapeutic e-stim through the skin to relieve pain. 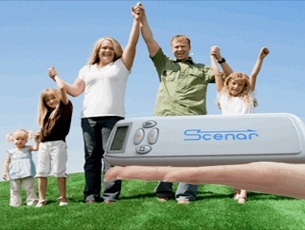 RITM SCENAR® is a handheld, reflex biofeedback device that is non-invasive and does not employ drugs or surgery. When stress, disease, or injury interferes with the body’s internal communication network, various symptoms and troubles can manifest, and the resounding message is: Pain. Chronic pain is like a “404 error” that you receive when you’re searching the Internet and encounter a page with which you cannot communicate—the proper connections just aren’t being made. Our overall health is similar in that the body relies on its own internal network to communicate information from one body part or body function to the other; when it encounters a “404 error,” that means communications are scrambled and the result is pain. RITM SCENAR® therapy restores that communication by correcting and connecting any ineffective signals. With gentle electrical impulses, the nervous system receives the appropriate messages that enable the body to make internal repairs and corrections on its own, and homeostasis—the body’s normal state or internal balance and stability—is restored. Can RITM SCENAR Help Me? RITM SCENAR® therapy is for prescription use only, so consult with your Weston chiropractor to find out if it is an appropriate therapy for the relief and management of your pain. Cleared by the FDA, RITM SCENAR® therapy is intended for those who suffer from chronic pain and acute pain and is often used as a complementary treatment for post-surgical pain and post-traumatic pain. The results from having RITM SCENAR® therapy are longer lasting than other electro stimulation therapies. With other e-stim therapies, the body often adapts to the treatment and, after a certain point, tunes out the signal altogether. Though relief may occur during treatment, the pain returns when the unit is no longer activated. RITM SCENAR® therapy sidesteps that problem by ensuring that there is no habituation to the signal—an innovation that sets RITM SCENAR® therapy apart. The RITM SCENAR® device delivers its signal, but then it waits for the body to respond with its own signal. By seeking this information via biofeedback, the device can adjust the next signal accordingly; therefore, each signal is unique and continually effective. I read this article and found it very interesting, thought it might be something for you. The article is called RITM Scenar Therapy and is located at http://www.windmillhealthcenter.com/chiropractic-services/ritm-scenar-therapy/.